Among us food blogger wanksters, there is a lone figure. She does not blog but is one of the most cookie-foodie and eatie-foodie persons I’ve had the pleasure to meet. Her name is Anna. A while back she organised for thirty of us to go to Old Kingdom on Smith Street and have the duck ‘three ways’. There was duck, there was BYO and there was barhops after. But when Anna asks if you’re interested in a second duckfest, how can you refuse? Okay, okay, I mean me. I jumped at the chance to see what duck offerings would be shovelled our way when we suggested a few of us go to Quanjude in the city. Quanjude has a clean, elegant fitout and is huge. The service is attentive, bordering on ingratiating. A word of warning: I do think that the staff here will generally upsell. If you ask them “Is this enough food for us?” they will indeed say no and encourage you to order squillions of things. This is how we found ourselves with an array of entrées before duck smashing antics could occur. Dear Penny of Addictive and consuming was given the task of selecting for our group of fifteen or so. Below are her selections for us. 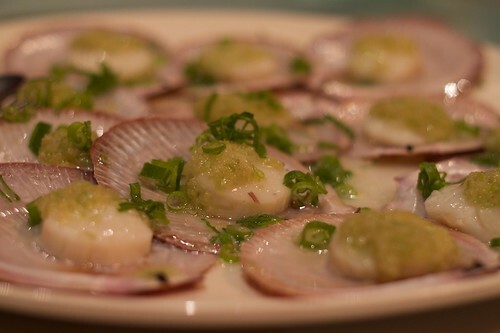 The scallops were probably my favourite – juicy and delicate in flavour. They also looked gorgeous in the shells. Pan-fried dumplings are a sure crowd-pleaser. 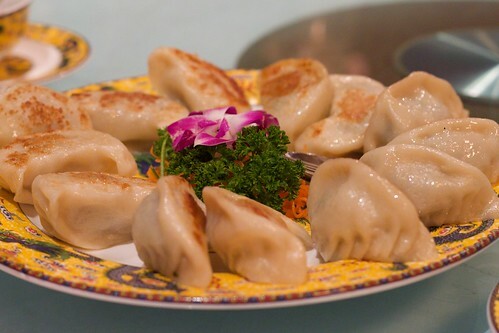 Not ground-breaking, but still, can’t go past a good dumpling. Laugh if you must, but I really liked the sesame toast even though Billy of Half-Eaten had suggested it as a joke and looked momentarily mortified when it arrived. It was all in good fun! Pinot-quaffing on this evening was a good deal more…staid than the previous duckfest Anna had organised. Again, I’d advise you to be careful because the staff did seem intent upon encouraging us to have more bottles than we seemed interested in. Then the duck arrived. They wheel it over so you can watch as they carve it at your table. A little gruesome, yes, but very impressive. 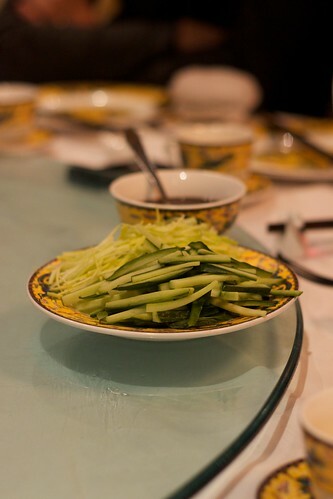 The condiments served to make up your Peking duck pancakes are very attractive. I’ve never seen thinly sliced cucumber look quite so elegant. 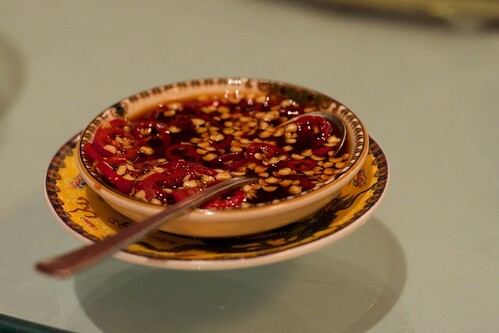 Or the chilli soy sauce – everything seems sliced with such care. Even the duck meat is made to look good when it’s served to you though I fear the dish used hints at an existential crisis waiting to happen. The Peking duck here definitely had more thought in regards to preparation, but a few of my fellow diners remarked that the hoisin was not as nice as at Old Kingdom, and they charged us extra for asking for additional pancakes! This would be okay except that they did not serve any of us the accompanying soup as promised with the ‘duck set’ the cost of which Anna wasn’t really sure of as it seemed to change depending upon with whom she spoke when trying to make a reservation. To sum up, the food is great and it’s a little expensive and I probably wouldn’t return unless my folks asked me to recommend a flashy Peking duck joint (some oldies don’t appreciate the ‘rustic’ touch of places like, say, Old Kingdom). 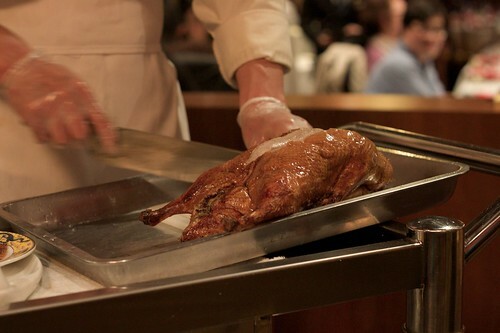 If you want to do Peking duck in style, it’s definitely worth checking out. This entry was posted in eatie-foodies dining out and tagged CBD, Chinese food, Melbourne, Peking duck, Quanjude on August 4, 2010 by gem. 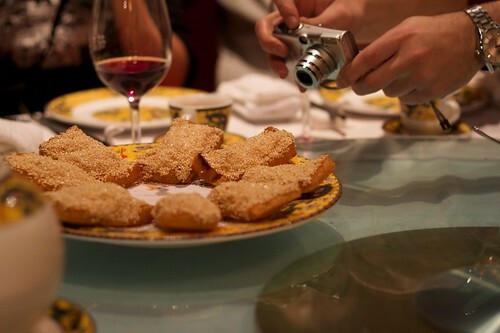 Look at that epic pimp watch (attached to the epic pimp arm) taking photos of the epic prawn toast. 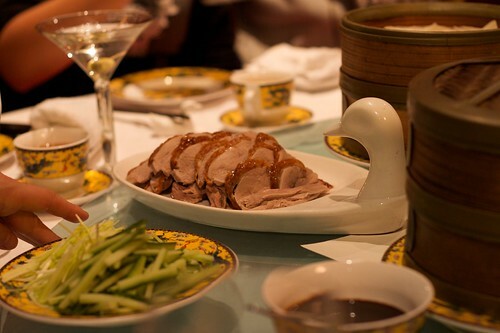 But seriously (and apologies for the ‘epic’ use of epic), Quanjude is definitely Peking duck ‘in style’. Nice to experience the upper-end of Chinese dinning, but it did seem rather upsell-ish as you say. The dishes all looked beautiful (especially the condiments), but there was something not-quite-right about the hoisin, and the pancakes (of all things) didn’t do it for me. Indeed re. the hoisin, I agreed with you and Anna. I don’t generally mind the upsell thing but the service seemed to vanish as soon as we said we didn’t require any more wine! I’m so happy Penny called my bluff on the sesame prawn toast, and I’m also happy you all share my secret shame in an unspoken love of it. However, I must say, I’ve had better. But then, I could make better. Once Richard has his deep-fryer christening, ye shall all despair in the face of my mighty fry-works. You guys should order the scallop dish! And the asparagus with beef. I had with my friends the other time. It was a hit! Peking duck in Quanjude is decent. I’m quite surprised why nobody asked about the soup. We sort of just sat there thinking they’d cleared the table to bring it out to us but they just brought the bill! I think we were all too shy/unknowing to demand our soup. If I had have known it was supposed to be served, I would have made more ruckus, hehe. Yeah, I reckon it’d impress my folks. I want to suggest it to them one day.